Hello there, It's Monday for Global Design Project and the designer team have chosen one of my cards to be source of inspiration for the challenge this week. And for my entry today I used images from 3 stamp sets : Cookie Cuter stamp set, Baby Bear stamp set and Sitting Here Stamp Set. 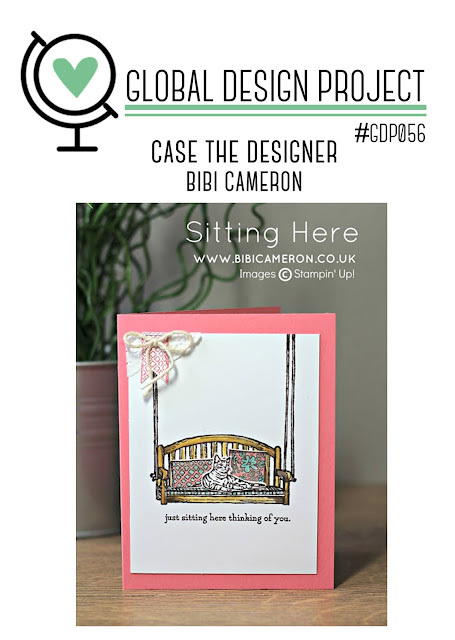 Click here to join the challenge this week or to have a look at what everybody is making! 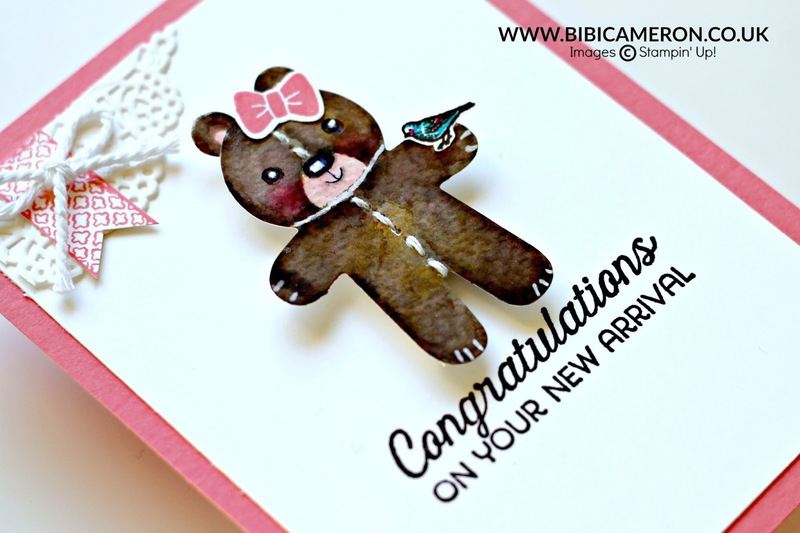 For the card above I used 1 of the Cookie Cutter bundle by Stampin' Up! this bundle includes a stamp set and a punch and you can buy them together and save 10% or get them individually. ah ! And this is a Xmas combo but it can be used to make any occasion cards. 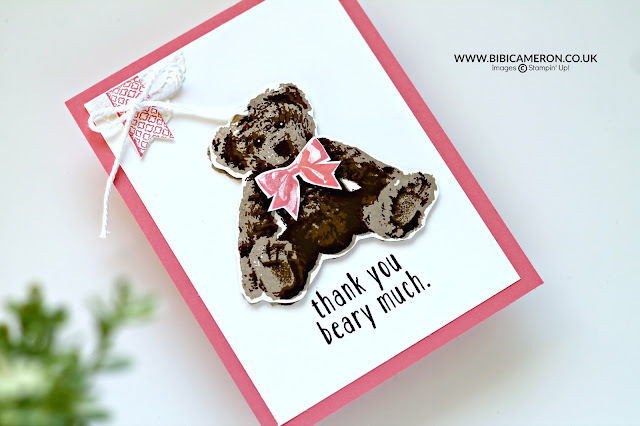 I stamped the teddy on water color paper using Crumb Cake ink and then, using Aqua Painters I applied washes of colours ( Early Expresso, Crushed Curry). I used Real Read ink for her cheeks and for her ears centre and jaws I used Flirty Flamingo and Brushing Bride. I punch it out with Cookie Cutter Builder Punch and I use a white pen to add some details. I couldn't resist and I hand stitch it! The sentiment in both cards was stamped using Early Expresso ink not as strong as black and looks vibrant sharp. 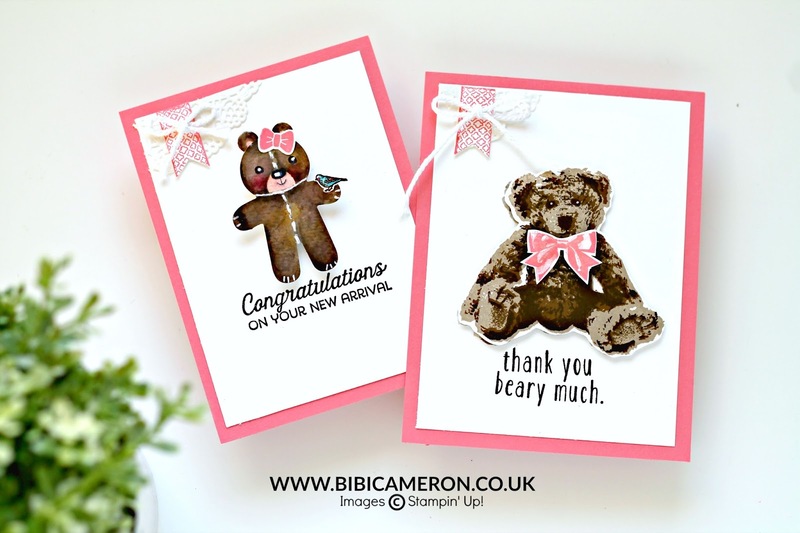 For the card above I used the multi step stamp set : Baby Bear. I stamped first directly on the panel starting by the stamp #3, then #2 and then #1 , but the image lose contrast so I stamped the teddy again in another piece of cardstock using the stamps in the right order, I cut it and I pasted on top of the first image. Inks: Stamp #1 + Crumb Cake ink | Stamp #2 + Soft Suede | Stamp #3 Early Expresso . You will find the numbers right next to each stamp in the box. For the banner I stamped 1 of the cushions images from Sitting here Stamp set with Flirty Flamingo ink on whisper white cardstock.